Apple Maps has recently been updated with indoor maps of five airports across Canada, Finland, and the United States. This follows last week's addition of indoor maps of 18 shopping malls in several Canadian cities and suburbs, including Toronto, Mississauga, Hamilton, Montréal, Calgary, Ottawa, Winnipeg, Vancouver, and Dieppe, New Brunswick. 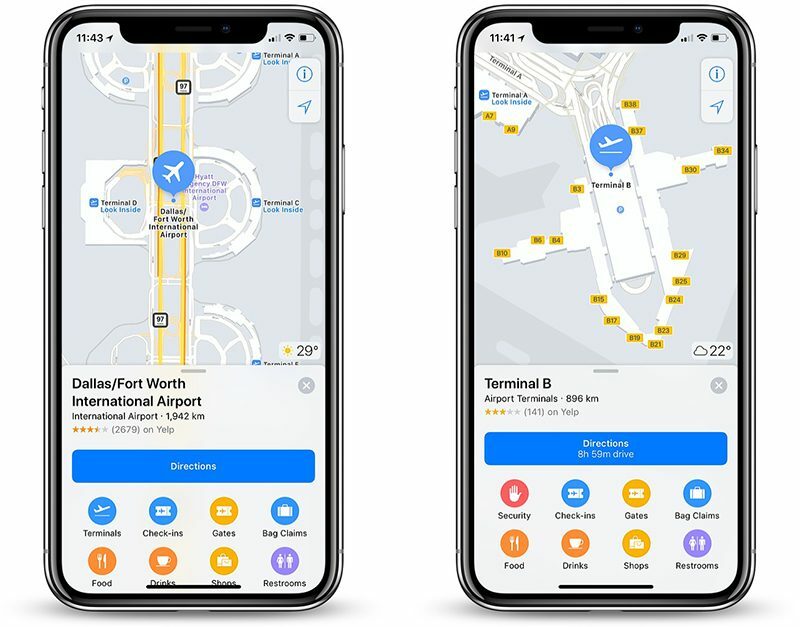 Apple launched indoor maps at select airports and shopping malls in 2017, with a list of locations available on its iOS Feature Availability page. To view an indoor map, open the Apple Maps app on an iPhone or iPad running iOS 11 or later, search for a supported location, zoom in, and tap on "Look Inside" if necessary. Seriously, what is taking so long for Atlanta..
Busiest airport in the country (though that's largely because of UPS traffic, not necessarily people). You'd think they'd have been one of the first. This is a great idea but how are they going to keep up with indoor maps at malls? Stores close all the time. Same way Google and Apple Maps do with any business. Each shop has a spot number equivalent to a suite number with their address. When they move or close, they can be flagged for closure. When someone else moves in the new tenant can be added. No different than when a business closes or moves in an office building. They sent a mapping team there a while ago, but no one has heard back from them since. I think these indoor mapping advancements are great but what I'd most like to see from Maps is outdoor road accuracy data improvements on par with Google Maps or better. As is, it seems most Maps advancements lately is these indoor maps. The question I would ask is how well can Maps get us to these locations so we can use such amazing indoor Maps? If it's taken me out to some empty field somewhere, it really doesn't matter how many floor tiles there are between the front of the GAP and the nearest Verizon kiosk in the mall. And yes, I know 5 guys will chime in how Maps has worked perfectly for them since day one, but that has not been MY own experience and I keep hoping it will get "good enough" ASAP. As is, I usually go to the extra steps trouble of using Google maps when I need to reliably get to a destination. Basically, I have more faith in it's data. And yes, I know Apple Maps-branded vans are rolling all around the country- have seen one in my little town in Florida myself. Hopefully that means we are going to get more accuracy soon. What keeps worrying me about that is that there are occasional stories posting how a state or two have been mapped, as if the job is done there now (now on to other states). But all of us know that roads- like stores in Malls- are evolving all the time. So the mapping should be an ONGOING project in ALL states (and countries) instead of doing a state here and there and- perhaps- considering that state "done." Hopefully, that's NOT what's happening but some of the stories have seemed to read like that. I think these indoor mapping advancements are great but what I'd most like to see from Maps is outdoor road accuracy data improvements on par with Google Maps or better. This is exactly why Apple has been working on revamping Maps for four years now and is currently in the early stages of rolling out an improved version. Have you not heard about this? I think it was revealed a few months ago. I live in Arizona so this is nice and for visitors who don’t know the layout. I think the airports maps are going to be an extremely useful tool to many people when they look at their devices for info and on the run. Well, it is Atlanta Hartsfield. I'm not sure anyone has ever been able to map that place, even the people that built it.